"The only constant is change, continuing change, inevitable change..." — Isaac Asimov The next evolution approaches and Legends of the Grim Future will be born across the galaxy. You must register to be able to access the PRIVATE Download Section and get your copy of the rules (TLRB v0.6.4!) & join discussions about the game! New to the forum & the community? Stop by and introduce yourself... we are a friendly bunch! We have been allowed to use amazing works from great amateur and professional artists. In this section not only you can find more about them, but you can contact us and learn how YOU could join this elite group of contributing artists! Enjoy everything our Community Event, The Prisoner Exchange 2012 has to offer, from rules to Prisoners' WiP and more! Write about your campaigns and share your battle reports. Not sure what Squad to play? Need help fine-tuning your Squad's List? Want to ask for new Tactics or share your battle Strategies? Come in... answers await! Post your Squad Background, stories and fan fiction! Post about your Death Squads' models paints, modeling and conversions! You have some cool scenery or terrain? Share your expertise. You have an interest tutorial or player aid that you wish to share? This is the right spot! 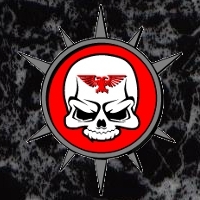 Post anything (models, scenery, stories, news) about Warhammer 40k. Post anything (models, scenery, stories, news) on your favorite fantasy wargames. Do you have other miniatures from other games you want to share? Lord GreyWolf certainly has! Join him (and every other freak around here) and reveal your creative side here! Have models or bits you want to trade for other models or bits? Post information here. Any general news, topics or rants can be posted here!